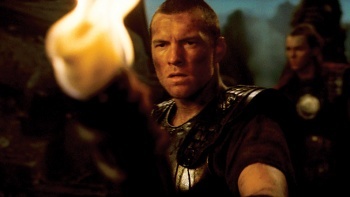 Leading man Sam Worthington, of Avatar fame, apologized to everyone for how awful the remake of Clash of the Titans was. While the 2010 remake of the classic action/fantasy film from 1981 was a box office success (grossing almost half a billion dollars internationally), I don't think a person alive who saw it would be able to seriously call it even mildly entertaining. Bluntly, it was a poorly written and badly acted CGI and lightsaber-filled mess that our own MovieBob described as "kind of a C+ remake of a B- original." Apparently Sam Worthington, who played Perseus in the film, agreed. "I think the first one, we kind of let down some people. I think I can act f***ing better, to be honest." he said. "The only point of doing a sequel is either the audience demands it or you believe you can better the first one. What we're setting out to do with this one -- the writers and the director and myself -- is improve," said Worthington. "Just take all the notes from people that I have been reading about on the 'net and give them a movie they f***ing want. This one I want to kind of try to satisfy a lot more people." Mr. Worthington, while I appreciate the thought behind the apology, I don't think you understand the point. Saying sorry for the first movie while promoting the next one is an awful lot like apologizing for punching me in the face, and saying that next time, it'll only be a kick in the shin. Well, thanks anyway, I guess.